3 Should You Buy A Glacier Bay Faucet For Your Kitchen? Glacier Bay is a house brand of Home Depot. 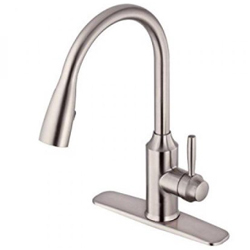 They produce and sell good kitchen faucets at a decent price. Did you know that Glacier Bay faucets can be installed very quickly? In fact, most people who are experienced with installing faucets will be able to install a Glacier Bay model in under 5 minutes. This can be considered an advantage, as the installation process is very easy and straightforward. You don’t have to worry if you don’t have any previous experience, though, because the faucets come with easy-to-follow installation instructions. In the first part of the following article, we take a closer look at what Glacier Bay has to offer as a manufacturer. Further, in the article, we present a small selection of Glacier Bay faucet reviews so you can see for yourself what they have to offer. To find out more about Glacier Bay, read the article below. When you buy a new faucet, you have to look for something that will be fashionable for years. Not only that, but you also have to find something that will work for a lot of time. With a Mediterranean bronze finish, this Glacier Bay faucet looks amazing, and it will enhance your kitchen’s appearance. The faucet will turn the heads of your guests, and it will attract many compliments whenever you have a visitor. This faucet comes with a ceramic cartridge for a drip-free performance, and it has a pull-down sprayer. The sprayer has a long reach that will be very helpful in the kitchen. The faucet comes with a deck plate and a matching soap disposer that also look nice. Beautiful Finish – The quality and aspect of the finish are simply amazing. This faucet looks great, and it will make your kitchen look better. 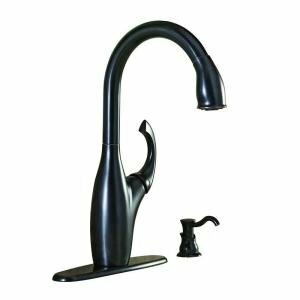 Tall Spout – This faucet comes with a tall spout. This will help when you clean the dishes because it will provide more clearance under the faucet. Soap Dispenser Doesn’t Work – Some customers complained that the soap dispenser they received was not working. If this happens to you, contact the customer service to receive a new one. Conclusion: This Glacier Bay faucet looks amazing, and it will enhance your kitchen’s design. If you want to replace your old faulty faucet with a new model, you should take a closer look at the Glacier Bay JY5000161. This faucet has a modern look, and it is very easy to install. The faucet has a nice design that will fit well in most kitchens. This model comes with a pull-down sprayer that will be of great help in when you’re cleaning the dishes. The sprayer has a considerable reach, and it will facilitate the tasks in your kitchen. This faucet uses a ceramic cartridge that will work for a very long time without leaking. The cartridge increases the faucet’s durability, so you will be able to use it for a long time. Easy To Install – The faucet is very easy to install, and most people will be able to install it themselves without encountering any problems. Deckplate Included – This unit comes with a deck plate that has the same finish as the faucet. Short Water Lines – The faucet is easy to install, but connecting it to the main water lines might be more difficult. The faucet comes with short water lines, so you might have to buy new ones. Conclusion: Glacier Bay JY5000161 is a good faucet that’s easy to install. 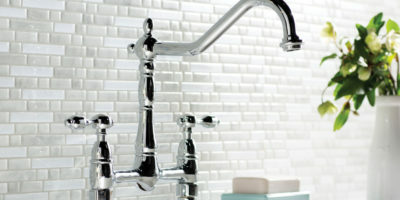 The faucets will look good in most kitchens, but it won’t become their centerpiece. Open coil faucets look amazing in a contemporary-styled kitchen. They look even better if your sink is installed on an island counter. 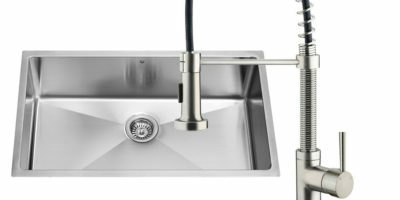 If you want to remodel your kitchen, and you’re looking for modern faucets, you should take a closer look at Glacier Bay’s 400 series. This faucet comes with a chromed finish that makes it pop up, and the open-coil design will make it the centerpiece of your kitchen. The faucet comes with a pull-down sprayer that will extend to all the corners of your sink. The sprayer produces two stream patterns, each better at certain tasks. Great Design – This faucet will look amazing in any contemporary kitchen. The open coin design is an eye-catcher, and it will make your kitchen look better. High-Quality Finish – The faucet’s chrome finish not only looks great, but it is also resistant to scratches. The finish is easy to clean and it will look as good as new for a long time. Aerator Can Get Clogged – This faucet’s aerator can get clogged easily, so you will have to take it out from time to time to clean it. Conclusion: The Glacier Bay 400 series faucet looks amazing, and it will improve every modern kitchen’s design. The Glacier Bay Invee is a pull-down faucet that is suitable for both 1 and 3-hole installations, making it perfect for every sink you will find on the market. The faucet comes with a deckplate that will mask the holes you didn’t use if you choose the single hole installation. 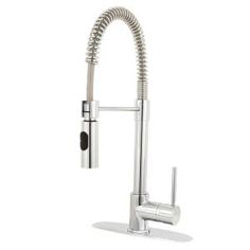 The faucet has a modern design that will look great in contemporary kitchens. 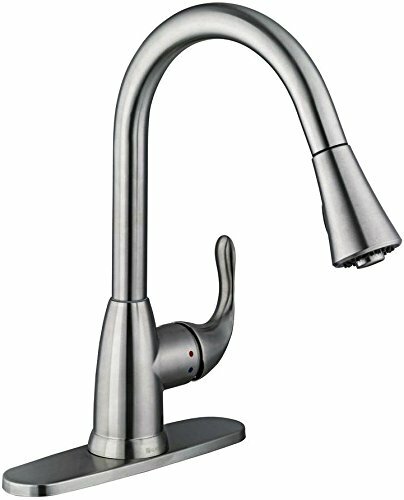 The high arch spout gives you a lot of clearance under the faucet, so you will be able to wash large dishes even if you choose not to use the pull-down sprayer. Easy Installation – The Glacier Bay Invee is a top mount faucet that’s very easy to install. Most people will be able to install the faucet in under 5 minutes after they take the old one out. Ceramic Cartridge – The faucet comes with a ceramic cartridge that will provide a leak-free operation for a very long time. High Water Pressure – This faucet produces a high water pressure. The powerful water pressure will help remove stains easier, but it can spill water easier. Conclusion: The Glacier Bay Invee is a nice faucet that produces a powerful water stream. The faucet will look great in contemporary kitchens, and it comes with a deck plate. Glacier Bay is a brand that develops and manufactures faucets for Home Depot. They are relatively small, and they’re cheap. Due to their low prices, some people might consider their products as low-quality ones, but that’s far from the truth. It’s true that you get what you pay for, as it is with every other product on the market, but when it comes to faucets, a large part of the price difference is also related to the manufacturer’s renown. Large companies have better advertising, and the money they spend on advertising ends up in the product’s final price. Since Glacier Bay is a house brand of Home Depot, they don’t have powerful advertising, so that’s one of the elements that factor in their low prices. Home Depot tries to sell a lot of merchandise to do-it-yourselfers, so you can expect that their house brands to do the same. This is true for Glacier Bay, and their products come with easy-to-follow installation instructions. Most people won’t encounter any problems during the installation, and experienced DIYers will be able to install their faucets in under 5 minutes. The good part is that you can find literally any part of these faucets at Home Depot, so you will be able to fix them easily if they break. Should You Buy A Glacier Bay Faucet For Your Kitchen? You might be wondering why choosing a Glacier Bay faucet might be beneficial. Well, we certainly did, and we did a thorough research into their products. In the following section, we present the results of this investigation, so you won’t have to carry out one of your own. – We’re not going to lie. Glacier Bay faucets come at great prices, and that’s one of their strongest advantages. If you don’t want to break the bank to buy a kitchen faucet, this is the brand you should look for. – Glacier Bay is the house brand of Home Depot, and since the mother company addresses a lot of its products to do-it-yourselfers, so does this one. This makes the faucets very easy to install, and the company boasts that their faucets can be installed in under five minutes. We found their boasts to be true, and every person experienced with DIY projects will be able to install one of their faucets quickly. – All the faucets produced by Glacier Bay have swivel spouts, so they will provide a lot of clearance around the sink. This will allow you to wash large dishes with ease, even if you prefer not to use a pull-down sprayer. – These faucets come with ceramic cartridges. This type of cartridges are very durable, and they provide a leak-free operation for a very long time. – Glacier Bay faucets come in various finishes. All of them have a good quality, and they’re resistant to the usual wear and tear they encounter in the kitchen. And the best part is, the finishes look great for a long time. – The faucets come with a single handle that controls both the water flow and its temperature. This will allow you to make all the adjustments you need with ease. – All the faucets produced by Glacier Bay come with a deck plate. You can choose to use the deck plate, and you should if you prefer a single hole installation, but you can choose a 3-hole installation and not use it. Since the deck plate is included in the price, you should compare how the faucet looks better and make up your mind. – Some of the faucets produced by this manufacturer are delivered with soap dispensers. The soap dispensers match the faucet’s finish, and they will make a good addition to your kitchen. These faucets are specially designed to be appealing to do-it-yourselfers. This means you can choose any model you want and install it on your own. Another advantage is that you can buy literally every single spare part individually and repair the faucets by yourself. You can find the spare parts if you go to your local Home Depot, but you can also find them online. You don’t have to worry if you don’t have any previous experience with repairing your own faucet. The manufacturer provides a lot of instructional videos you can follow to repair the faulty unit. 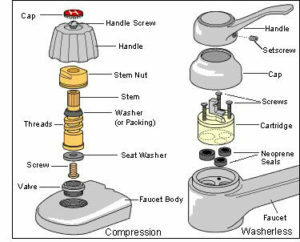 Since the faucets are specially designed for DIYers, they are usually easy to fix. These faucets come with a limited lifetime warranty. The warranty covers all the defects in materials or craftsmanship. Any faulty parts will be replaced for free by the manufacturer. You only have to call Home Depot’s customer support service and send them the broken part to receive a replacement. You will also need the original sales receipt for the warranty to apply. If you want to contact the manufacturer’s customer support service, you can do it via phone. You can also contact Home Depot’s customer service, or you can go to the closest Home Depot retail locations. Despite their low prices, Glacier Bay faucets use some of the latest technologies to provide a good product. Here is a short list of the technologies used for these faucets. – These cartridges are specially designed to last a very long time. They provide a leak-free operation. – Some of the faucets come with a pull-down sprayer. The sprayer has a long reach, and you will be able to use it for your tasks around the kitchen. Glacier Bay is the house brand of Home Depot, so they’re not very renowned. Due to their low prices, people tend to consider their products unreliable, but that’s far from the truth. In fact, their products are pretty durable, and they can be fixed easily if they break over time. All of their faucets come with a limited lifetime warranty, so you can receive free spare parts from the manufacturer if something goes amiss. We’re sure that after reading this article you changed your mind about their products. As you could see from our short Glacier Bay faucet reviews, this company produces reliable units that perform well over time. Their products come at a low price, but they tend to look just like the ones produced by larger manufacturers that cost a lot more.